While unexpectedly meeting up with an old friend at New Year’s, we compared favorite dives. A bunch of names were thrown around and after three months I finally got myself in gear to visit one I thought I would never step inside of. 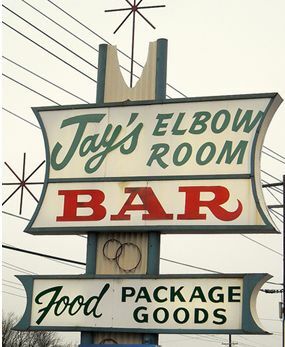 Now whether it was JerseyBites.com’s “wing off” article that inspired me or the fact that I now had a bar buddy for safety in numbers I can’t say but the other week I made the visit to Jay’s Elbow Room on Route 73 in Maple Shade. You’ve definitely passed it before and probably, like me, gave it a passing glance and wondered how it could still be open. If you want the bar/pick-up spot hybrid favored by newly legals (not putting them down, I like to dance on the weekends on occasion and am no stranger to those well-known pubs too) then keep driving-it won’t satisfy those needs. But if you want to actually watch a game without getting rushed through your beer or go into debt stop in. 1. Do not eat a late lunch. To get your money’s worth you need two or more orders of wings and that will not happen with the afternoon’s supremo salad taking up valuable space. Check out their Facebook page for each day’s shot and drink specials. Currently they have $2 pints and $8 pitchers of Miller Lite and $1 dogs during every Phillies game (hot dog eating contests have been known to break out between friends—I was a witness); Bud and Bud Light $1 mugs, $1.50 pints, and $6 pitchers all day every day; and Flying Fish Fridays with $2.75 pints and $11 pitchers. They also do carry out service. So after you’ve worn out the bar (stays open until 3am under a grandfather clause) you can bring the party back to your house with a variety of bottles to choose from their fridge. This entry was posted in Bars, beer, Happy Hour, Wings and tagged bars, beer, dive bar, Maple Shade, New Jersey, Phillies, wings. Bookmark the permalink.